Nowadays, virtualization and cloud technology are more popular than ever. This means that businesses need high availability, reliability, security, and scalability for their IT infrastructure. Companies are increasingly addressing these needs by turning to multi-tenant backup solutions. Today’s blog post discusses how multi-tenancy can be used within the framework of cloud-based backup services to achieve optimal results. The post also explores how NAKIVO Backup & Replication’s multi-tenancy feature works with AWS. Multi-tenancy is an architecture that provides separation between tenants, whereby one shared instance of a software application installed on a server can serve multiple customers (called tenants in this case). Standard, single-tenant architecture requires installation of an application instance for each tenant. Multi-tenancy allows logical isolation of tenants from each other. Tenants can customize their application settings, but cannot access the application code. In simple terms, multi-tenancy can be likened to a building with multiple apartments protected by unique locks. Each apartment owner (or renter) has a unique key with which he or she can access only his or her own apartment. Despite the fact that the apartments are located in the same building, the apartment dwellers know nothing about the other apartments, their inhabitants, and their contents. The building owner has set up communications (e.g. Internet or phone line connections) for the entire building and shared them among the apartments, rather than each apartment establishing their own communications infrastructure individually. The apartment dwellers order electricity, plumbing, gas, etc., use them as needed, and pay the building owner for those services they have used. Similarly, tenants can subscribe to the services they need from a managed service provider (MSP) and use them in accordance with their demands. Let’s explore who might benefit from using a multi-tenancy arrangement. Multi-tenancy is sometimes used in large enterprises, with different departments as the tenants. However, the most interesting use case for multi-tenancy is that of managed service providers (MSPs) in cloud environments, such as AWS. There are a number of reasons customers might want to achieve their IT needs through a cloud-based MSP in this way. In some cases, smaller companies don’t have a full-time IT specialist in their staff; they would experience difficulties with the technical setup, configuration, and maintenance of the IT infrastructure they need. Some customers simply want to avoid the technical (as well as financial) issues associated with deploying physical servers and configuring the software in their own environment. Furthermore, in the cloud, tenants pay only for what they use. For example, once a big project is finished for a company, the resources of the virtual machines (VMs) that were running for this project are freed up and those VMs become unnecessary. If the customer uses managed services, he or she can simply delete these VMs (or Amazon EC2 instances) and avoid paying for the unused resources. When using a physical server (even one running virtual machines), this would not be an option, and some of the server’s resources would remain idle, wasting money. This is one of the most common reasons a customer might opt to begin using cloud-based services provided by an MSP. The most popular of these services are known as “infrastructure as a service” (IaaS), “platform as a service” (PaaS), and “software as a service” (SaaS). In this blog post, the following SaaS elements are considered: “backup as a service” (BaaS), “replication as a service” (RaaS), and “disaster recovery as a service” (DRaaS). MSPs are interested in optimizing usage of hardware resources, financial resources, and human resources. This is why the multi-tenancy approach is ideal for them. MSPs can set up one instance of software with multi-tenancy support on the server in the AWS cloud, and use this to provide services for multiple customers with separate accounts. There is no need to set up individual instances of the software for each user. Let’s explore the advantages of using multi-tenancy for MSPs, as well as the advantages for the customers using managed services, in the framework of VM backup, replication, and disaster recovery. With the multi-tenant approach, the MSP has fewer software instances to upgrade and support. Once updated, the software product is available for all their tenants (customers). If they were administering SaaS with a single-tenant product, technical specialists would have to update or upgrade each customer’s instance individually. Supporting software with multi-tenancy means fewer technical specialists are needed and less hardware resources are required for servers. This is because fewer instances of the software must be maintained, with the tenants all using the same resources and infrastructure. Thanks to the features just outlined, software that supports multi-tenancy can save you time and money. In the long term, using multi-tenant architecture brings down investments, which is one of the crucial benefits of the paradigm. This is because application resources are shared among tenants who use same applications, which reduces costs associated with maintenance and support. When an MSP uses a multi-tenant product, which saves them costs, they can pass on those savings, offering more affordable prices for customers. Thus, the MSP can attract more clients to buy the provided services. Adding new users is much easier and more convenient, without the need for the MSP to add new servers, virtual machines, or application instances. Multiple tenants are supported by the same instance running on a server. The scalability of multi-tenant software means the provider can increase their offerings as business improves. With multi-tenant architecture, the MSP can monitor usage of the system. With sound analytics, they can then use the information gathered to evaluate and improve the services they provide. The MSP could upgrade or reorganize their infrastructure, as well as modify their software product subscriptions according to their analyses. The multi-tenant solution eliminates the need for customers to hold their own expensive infrastructure, which would require investing into maintenance and support. Servers can be run as virtual machines in the cloud, for example, using Amazon AWS. Customers can perform backups to the Amazon cloud without buying expensive physical hardware or tape libraries. They can focus on their core business without having to worry about their IT infrastructure. Customers don’t need to update or upgrade the software that is used as a provided service. In fact, users of NAKIVO Backup & Replication’s multi-tenant solution don’t have to install the software at all; the MSP does that. The software is updated by the MSP regularly, while customers can customize their environments to meet their needs. Using multi-tenant services is secure. Tenants cannot access one another’s virtual environments. With the growing popularity of cloud technology and virtualization, data protection for virtualized environments has become critically important. Backing up business-critical data is a must for companies, regardless of whether they keep the data locally or in public or private clouds. As per the 3-2-1 backup rule, best practices recommend that you have 3 copies of data, 2 of which are stored on different devices, with at least 1 stored offsite. You could have virtual machines running in the cloud backed up to a physical device located in your company’s office. If your company doesn’t have infrastructure of their own, you could back up from your cloud environment to a remote site, or store your backups in a different cloud – e.g., within a different geographical region of the Amazon cloud. Similarly, VMs running on physical servers onsite can be backed up to cloud (usually with an MSP). Backup as a service (BaaS) is a suitable solution for companies needing backup of their VMs either from the cloud or to the cloud. MSPs aim to satisfy customers who need high reliability as well as high availability; typically, they provide more than just BaaS. Replication-as-a-Service (RaaS) and Disaster-Recovery-as-a-Service (DRaaS) are usually offered alongside BaaS. This extended solution is in high demand for backup, replication, and recovery of local VMs as well as VMs in the cloud, whether to onsite or cloud locations. To provide the best service for their clients, MSPs regularly upgrade their infrastructure and deploy reliable multi-tenant software with user-friendly interfaces. To promote cloud business growth, MSPs need an easily scalable solution that can reduce the costs associated with deployment and administration. Such solution must be secure, ensure high performance, and have optimized resource utilization. Ideally, backup, replication, and disaster recovery can be managed from a single pane of glass. Preferably, when working with virtual environments, the software selected should be agentless. NAKIVO Backup & Replication is an agentless solution developed with the experience of both MSPs and their end customers in mind. The product can be used to provide BaaS, RaaS, DRaaS for VMware and Hyper-V virtual machines as well as Amazon EC2 instances. NAKIVO Backup & Replication allows users to back up and recover VMs or EC2 instances, in clouds as well as from clouds. The product’s multi-tenancy functionality is easy to deploy and configure; consult this blog post for a step-by-step guide. NAKIVO Backup & Replication has a Multi-Tenancy Portal specially designed for use by MSPs. With this portal, MSPs can manage tenants (create, delete, or modify tenants), configure settings (such as number of sockets per tenant), and monitor usage statistics, all from a single pane of glass. From the customer’s side, tenants can access the self-service portal after entering their unique login and password. One instance of NAKIVO Backup & Replication with multi-tenant architecture can support up to 1,000 isolated tenants. NAKIVO Backup & Replication can be deployed in the Amazon AWS cloud quickly and easily. Thus, the product can be used even if there is no on-site infrastructure. This is especially useful for the purposes of providing managed services in the Amazon cloud. The MSP can customize the NAKIVO Backup & Replication workspace branding to provide a smooth experience for their customers. Service providers can standardize the product’s appearance to match with other products they use and have branded, ensuring that all their provided services present a consistent corporate style. The following elements can be customized: product title, product logo, company name, website URL, contact email, support email, contact phone number, background, bookmark icon, color, header opacity, and footer opacity. The Multi-Tenant edition of NAKIVO Backup & Replication provides a Self-Service portal for offloading a part of backup and recovery tasks to customers. Each customer (tenant) can manage their own backup, replication, and recovery jobs by accessing their dashboards. The jobs and inventory of one tenant are not visible to other tenants. When a tenant is created by the Master Admin (on the MSP side), a tenant admin account is generated as well. A tenant admin can be granted privileges (by the MSP) for full control of the product features within their dashboard, all from their web browser (even from a mobile device). For a customer to use the Self-Service portal, the MSP should send the tenant a link for the NAKIVO Backup & Replication Director, providing their tenant admin login and password. For instructions on configuration of the Self-Service portal for delivering BaaS, see the walkthroughs in this blog post. NAKIVO Backup & Replication is most often licensed on a per-socket basis (CPU sockets). 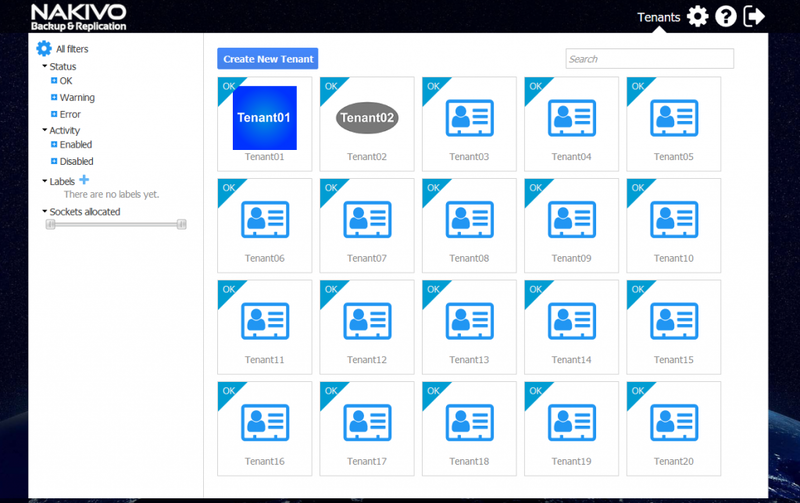 In the Multi-Tenant mode, the product provides the License Delegation feature: the MSP, as the Master Admin, can install one multi-socket license and delegate the appropriate number of socket licenses from the “Master license pool” for each tenant. For example, the MSP could buy a 100-socket license then delegate a 2-socket license for tenant A, a 3-socket license for tenant B, and a 5-socket license for tenant C. At this point, the MSP still retains a 90-socket license. Licenses can be reassigned by the MSP among tenants at any time. For example, the MSP could add one more socket to tenant A or revoke two sockets from tenant C. Like all the multi-tenancy features, license delegation feature is available in the Enterprise editions of NAKIVO Backup & Replication. A per-VM or per-instance license can also be requested by MSPs for greater flexibility; this is called the Cloud Provider Enterprise Edition. Multi-tenancy is an integral technology for clouds that combines the advantages of virtualization and remote access. With the Multi-Tenant mode, NAKIVO Backup & Replication is a powerful solution for MSPs wanting to provide BaaS, RaaS, and DRaaS. The product can be used even without any onsite infrastructure, in clouds like Amazon AWS, which is a great way to meet the needs of MSPs and end users alike. Tenants can be managed by the MSP’s Master Admin account from a single pane of glass with the Multi-Tenancy portal. High performance, universality, scalability, affordable pricing, and a flexible licensing model make MSPs using NAKIVO Backup & Replication more competitive. Download the full-featured Free Trial and try the product yourself.